I am banning paper towels and paper plates! My husband may freak on me! After FINALLY watching the dvred Earth Day episode of Oprah I am never even buying paper towels, napkins, or paper plates again. They showed the garbage swirl in the Pacific Ocean which spans from the coast of California all the way to Japan. In some places it is 90 feet deep. It is full of plastic bags and household trash. 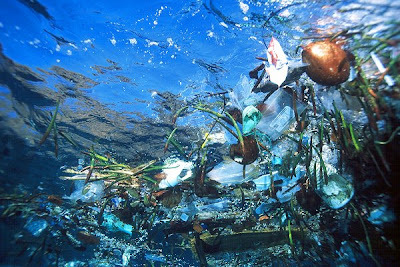 A glimpse of the trash in our oceans! I have already quit using plastic bags as my New Year’s Resolution and that is going great! I stash them everywhere; my car, on the door knob on the front door so I remember to take them, in my diaper bag, and in my stroller. Right now I am pretty good about using cloth napkins in lieu of paper, and I have started using regular plates for sandwiches instead of paper plates. But I know there are times when I reach for the paper stuff out of habit, or convenience, or laziness, or all three. If they do not exist in my home, then I have to use the real stuff. Now, every time I have a wheat bread sandwich with muenster and turkey and a side of Sun Chips (their bags are made from 33% recycled materials) I will be high class. Linens and China with my sammich! Now, cleaning. I used to be a paper towel-aholic. It made me feel as if what I was cleaning was cleaner since on the last swipe I could use a clean paper towel, not a dirtied up rag. Growing up I never ever used paper towels for cleaning. We were poor so we used towels and old rags. I think I rebelled when I was no longer poor. Paper towels were some sort of luxury! And it has come full circle. I am back to using rags to dust my furniture, wipe my counters, polish my plant leaves, and I think I will use newspaper to clean my glass. I still use paper towels for glass at the moment but if I have none then I have to figure out something!!! It is one baby step at a time. I don’t believe you can go from all modern conveniences to urban homesteading in one day. Each week/ month I choose a new way to reduce my family’s impact on the environment. The next step will probably be a worm composting bin!!! I am so scared and so excited about that at the same time. Even though we only throw out 1-3 bags of garbage a week, the majority of those bags contain food waste and paper plates/towels. Within the next 2 months if I succeed I should be throwing away only 1 bag per week. I will keep everyone posted with my progress!